MESA, Ariz. -- Michael Phelps has lost in the first final of his comeback after a 20-month retirement in the 100-meter butterfly final at the Arena Grand Prix on Thursday night. Ryan Lochte touched first in 51.93 seconds, second-fastest in the world this year. Phelps took second in 52.13 in his first meet since retiring after the 2012 London Olympics. Why did Michael Phelps come out of retirement? 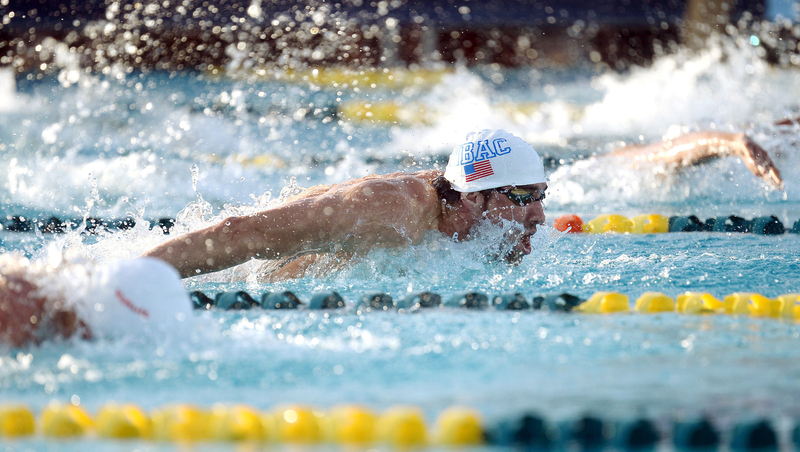 Phelps is the three-time Olympic champion and current world record-holder in the event. His time tied for fourth-quickest in the world. Olympian Jason Dunford of Kenya finished third in 53.08. Phelps was faster in the final than he was in winning his preliminary heat with a time of 52.84. Swimming before a sellout crowd and lots of cameras, Lochte led at the turn and Phelps was second. "Down there at the turn I kind of peeked over and I saw him and almost started smiling," Lochte said about his longtime friend and rival. Phelps interjected, "Why? Because you were ahead?" An on-deck interviewer reminded Phelps his mother has said she wants to go to Rio for the 2016 Olympics, which would be his fifth. "Whatever he wants," Debbie Phelps shouted from the stands. Phelps wasn't smiling as he walked on deck for the final, unlike in the prelims. He kept his ear buds in until he was introduced as an 18-time Olympic gold medalist. With his long hair sticking out from the back of his cap, he dived in next to Lochte, who beat him down to the first turn. The three-day meet sold out every session the day his comeback was announced last week, with a capacity of 1,200 at Skyline Aquatic Center. A pair of $40 all-session tickets was being advertised online for $250. USA Swimming issued 100 media credentials - five times more than usual. The possible future of American swimming with the same first name as Phelps was in the 100 fly heats. Michael Andrew, 15, qualified for the 'C' final in 55.23. He has broken more than 30 national age-group records and last June became the youngest U.S. male swimmer to turn pro. He was excited to meet his idol Phelps on Wednesday. "Swimming needs you!" he tweeted after they traded handshakes. "You rock!" Both of Phelps' times were easily good enough to surpass the qualifying standard of 54.79 for the U.S. national championships in August. That meet will decide the team for next year's world championships. "One step at a time," he said in the morning.